Immigrant workers confront the construction industry in Texas’ state capital. This article is from the September/October 2009 issue of Dollars & Sense magazine. Scroll down to view three videos on the Worker Defense Project. On June 11, 2009, three immigrant construction workers fell to their deaths when a scaffold gave way on the 11th floor of a high-rise apartment project near the University of Texas at Austin. The tragic deaths of Wilson Joel Irías Cerritos, Raudel Ramírez Camacho, and Jesús �ngel López Pérez sent chills through the Latino/a immigrant community in Austin. The loss of these three young workers from Mexico and Central America offered a bleak reminder of the dangers of working construction in the Lone Star State. Texas is one of the fastest growing states in the country, boasting a massive population of over 24 million people and a booming construction industry to keep pace with its rapid development. Yet growth has come at a significant cost to those building the state’s commercial buildings, resident housing, and infrastructure system. A construction worker dies on the job every two and a half days in Texas. According to the most recent statistics from the U.S. Department of Labor, 142 construction-related fatalities took place in 2007 alone, up from 131 the previous year. Statistics like these have made Texas the deadliest state for construction workers, with California at a distant second. For the past seven years, WDP has mobilized thousands of Latino/a immigrant workers in Austin to combat rampant exploitation in the construction industry. WDP’s increasingly strong base is a testament to their participatory organizing model, which prioritizes the leadership of those directly affected by social inequality. After years of grassroots organizing, alliance-building, and direct action, WDP has begun the process of reigning in the worst abuses in the industry; and they’re doing it from the ground up. In mid-June, Workers Defense Project released a comprehensive report on the construction industry, Building Austin, Building Injustice: Construction Working Conditions in Austin, Texas. The study was done in conjunction with faculty from the University of Texas at Austin and from the University of Illinois in Chicago. Based on over a year of research into local, state and federal data, as well as 312 in-depth surveys onsite with construction workers and 20 interviews with local employers, Building Austin provides staggering data on the social and economic costs of the city’s growth. The city of Austin, known as the “Live Music Capital of the World,” has been at the forefront of Texas’ growth spurt. With its progressive character and vibrant music scene, Austin has attracted scores of new residents in recent years, becoming the second-fastest growing metropolitan area in the country. The physical evidence of the city’s development is inescapable: cranes dominate the skyline in downtown, while the wooden skeletons of future homes can be found in neighborhoods across Austin. However, few Austinites look beyond the new buildings to consider the plight of the builders. The workforce of Austin’s construction industry, as in many cities in the United States, is largely composed of Latino/a immigrants. 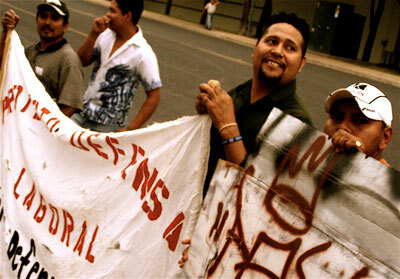 Over two decades of neoliberal reforms—defined by the drive to “liberate” the free market through extreme privatization and deregulation—have forced thousands of men and women from Mexico and Central America to leave their homes, and often their families, to find work in Austin and other cities of “El Norte.” From 2000 to 2007, the Latino/a population in Austin expanded by 45%, while the proportion of Latino/a construction workers grew by 13%. These workers generally put in long hours for little and sometimes no pay, and their immigration status often leaves them at risk of being taken advantage of by unscrupulous employers. Due to the number of unreported cases, it is impossible to determine the total amount of unpaid wages in the construction industry in Austin. However, WDP estimates that it handles close to $7 million worth of unpaid wage cases every year from construction workers. Because of their immigration status, undocumented workers suffer disproportionately from wage theft, along with other abuses in the industry. Video credit: ZGraphix—produced by Jeffry Zavala; directed by Jason Cato. In addition to wage theft, Building Austin uncovered rampant workplace violations. Fifty percent of surveyed construction workers reported not being paid overtime. Forty-five percent earned poverty level wages. One in five suffered a workplace injury requiring medical attention. Sixty-four percent lacked basic health and safety training, while many workers had to provide their own safety equipment. An ill-equipped and largely toothless regulatory system has left dubious working conditions unchecked for years in the state’s capital. The majority of workers surveyed had never even heard of the Occupational Health and Safety Administration (OSHA), much less other regulatory agencies. In fact, Texas has the fourth-lowest number of OSHA inspectors, despite its construction boom in recent years. According to Building Austin, not a single worker who experienced wage theft reported the crime to the Texas Workforce Commission, the Department of Labor, or the Austin Police Department, the agencies responsible for handling unpaid wages. Instead, many workers risked going to their employers directly to recover their due pay. Yet employers proved to be unreceptive. Upon confronting their boss, many workers were threatened with being fired or reported to immigration authorities. In some cases they were even threatened with physical violence. Lax enforcement in the construction industry is the product of over two decades of severe deregulation, beginning with the Reagan administration and continuing through the current economic crisis. During this period, reported the Texas Observer, “the emphasis shifted from enforcement to voluntary compliance.” The Texas Workforce Commission, the state agency responsible for investigating wage and hour violations, has not performed a single field investigation since 1993, the year the State Legislature slashed its funding. Since then, investigations have been limited to telephone and email; satellite offices throughout the state have closed down; and only 24 labor law investigators are left to cover the entire state of Texas from a single office in downtown Austin. In the absence of an effective regulatory system, WDP has organized thousands of undocumented workers to build a more just and equitable construction industry. Workers Defense Project emerged in response to the growing crisis of wage theft for immigrant workers in Austin. Founded in August 2002, WDP began as a largely white-male-led social-service organization, primarily focused on wage-claim issues. Yet after some staff changes, strategic planning, and careful capacity-building, WDP has developed into one of the most dynamic member-driven organizations in the city’s labor movement. Democratic participation by the membership of over 400 Latino/a immigrant workers is valued and encouraged at all levels of the organization. Members weigh in on key decisions through monthly general assembly meetings, weekly gatherings by the Construction Worker Committee, and through the board of directors—more than half of which is composed of immigrant workers. The increasing depth of participation, although not always a smooth process, has strengthened WDP as an organization, and strengthened the resolve of its members to step into the trenches of social change. Ruíz came to the organization a year ago after an employer refused to pay him overtime. Since then he has been involved in several direct actions against employers, given a speech at the most recent May Day march, and played an active role in recruiting new members. He is now one of the main facilitators of WDP’s leadership development course. For many worker-members, Workers Defense Project offers an introduction to direct action. Over the years, the worker center has recovered over $500,000 in unpaid wages. In some cases, employers are willing to concede what they owe through negotiation, while others require more convincing. When employers refuse to pay, WDP takes the fight to their doorstep, mobilizing dozens of worker-members and community allies to confront the problem head-on. In late 2008, one of the nation’s largest homebuilders, KB Home, gave in to over five months of public pressure from WDP, paying nearly $7,000 in back wages to seven worker-members who built luxury homes for the housing giant. The campaign against KB came to a head in September when over 60 community supporters, union members, and faith community leaders joined WDP to occupy the home builders’ main office in north Austin, demanding immediate payment for the seven workers. Bypassing the security guard, protesters flooded KB’s main lobby, circling the reception desk to await a reply. The following day, KB contacted Workers Defense Project and agreed to pay. In the process of struggling for immediate gains, direct action puts the strength of collective action on display, deepening a sense of solidarity among the workers and their allies in the community. “Instead of politicians giving us all the changes we need,” notes Ruíz, “[direct action] gives us the sense that we can change things, through uniting, through organizing ourselves.” In a city with notoriously lax enforcement, WDP has taken labor law into its own hands, braiding workers and their allies into a common struggle for a more just workplace. Carlos Pérez de Alejo is a volunteer with the Workers Defense Project and a collective member of Monkey Wrench Books, an all-volunteer, collectively run bookstore. His writings have appeared in YES! and Z Magazine. Sources: “Dying to Build: Why Texas is the Deadliest State for Construction Workers,” Texas Observer, June 12, 2009; Bill Fletcher Jr. and Fernando Gapasin, Solidarity Divided: The Crisis in Organized Labor and a New Path Toward Social Justice, UC Press, 2008. For more information, visit workersdefense.org and buildaustin.org.